Human advancement requires the realization that each one of us has an essential role to fulfill to lead humanity into a new era of true equality and prosperity. In Awakening Leadership, Horner describes how mindfulness reconnects us to the Unified Field of Creation, opening the door to our infinite nature and our life’s purpose. If Earth’s prime directive is oneness, its universal guiding principle is sustainability. In the New Leadership Blueprint, sustainability becomes the all-inclusive compass that redefines morality, values, the way we care for one another and the planet. 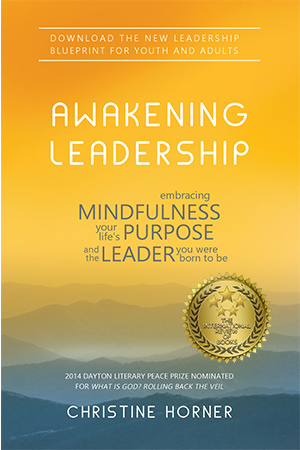 Transcending boundaries, Awakening Leadership is an illuminating “human” guide that will inspire you to immediately begin living your life on purpose toward building a better world. It’s your time to thrive!